Jio Jalalon and the Chiefs adds the Martin Cup to the Got Skills title they won earlier this month. 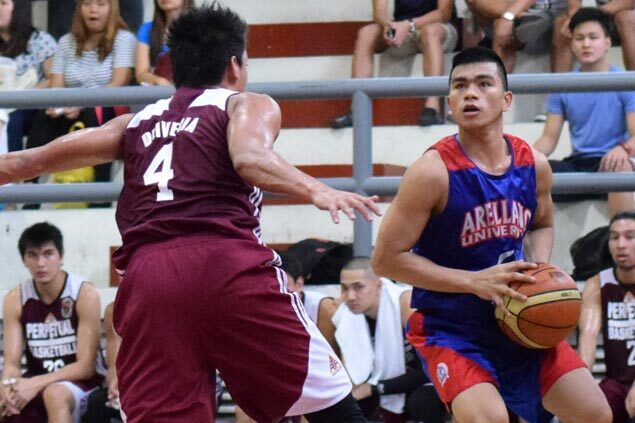 ARELLANO defeated Perpetual Help, 75-71, to win the 12th Fr. Martin Collegiate Open Cup at the San Beda Gym. Jiovani Jalalon and Allen Enriquez scored 13 points each for the Chiefs, who bagged their first Fr. Martin title in three tries. It was also the Chiefs’ second offseason title in a month after topping the Got Skills 25-under basketball tournament. Bright Akhuetie scored 30 points for the Altas. Arellano managed to limit Akhuetie in the endgame after the 6-foot-8 behemoth was able to cut the Chiefs’ lead to three points, 66-63, after trailing by as many as 13. Jalalon and Dioncee Holts scored crucial baskets in the endgame, making it a 75-69. The 22nd Fr. Martin Cup Summer Tournament opens on April 3 at the San Beda gym.